Do You Need A Salvage Permit For Deer Skull/Antlers? Every winter and spring shed hunters find and pick up big “deadheads,” and many of them can’t wait to post images of their finds on Facebook or Instagram. Let me remind you that if you find any size skull with antlers attached in the woods you might—actually you probably– need to obtain a salvage permit (or at least verbal permission) from the state to possess and transport that skull/antlers. You do not need a permit to pick up and possess shed antlers (no skull). 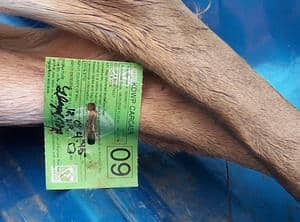 In most states a deadhead—the skull and rack from a buck that died of disease, was hit by a car, or was lost by a bowhunter in the fall—is treated like a roadkill buck, and subject to the same state laws, which in most cases means you need to call a conservation officer or sheriff and get a salvage tag (or official permission) before you move and take possession of the antlers. States where I can confirm you need a salvage permit, which is usually free and available online, for a deer skull include: Kansas, Illinois, Iowa, Missouri, Indiana, Pennsylvania, Ohio, New Mexico, Arkansas, Montana, Washington, Michigan, Idaho, Oregon, North Carolina, and there are certainly many more. Check your state regulations before you go shed hunting. This entry was posted in Big Bucks, BigDeer, Deer Hunting, Hunting Laws, mule deer, whitetail deer by admin. Bookmark the permalink. Pa. charges you for that permit same as roadkill, apparently they need the $$ so bad for their primo pension and health care plans for employees. Or to buy out another Commissioner they want to retire.